With color A, cast on a multiple of 6 sts + 3. Row 1 (Wrong side): With color A, purl all sts. Row 2 (Right side): With color B, k1, * k4, sl 2 wyib; repeat from * to last 2 sts, k2. Row 3: With color B, p2, * sl 2 wyif, p4; repeat from * to last st, k1. Row 4: With color A, k2 * sl 2 wyib, RT, LT; repeat from * to last st, k1. Row 6: With color B, k2, * sl 2 wyib, k4; repeat from * to last st, k1. Row 7: With color B, p1, * p4, sl 2 wyif; repeat from * to last 2 sts, p2. Row 8: With color A, k1, * RT, LT, sl 2 wyib; repeat from * to last 2 sts, k2. 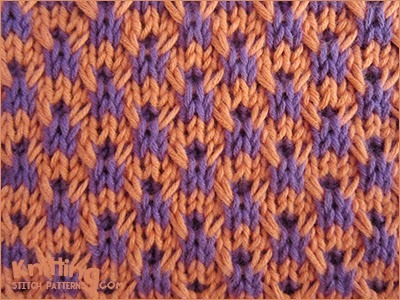 Right twist (RT): Skip 1 stitch and knit the second stitch, leave on needle; then knit the skipped stitch, slip both stitches from the needle together.